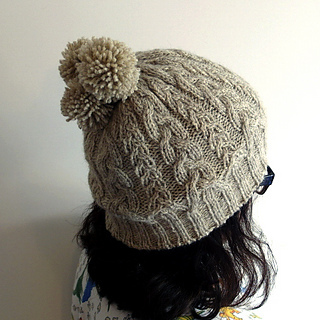 Cable swatch: 19sts = 2.5"
Bubble & Squeak is a cosy cabled beanie hat, with optional pompoms. It’s a remix of my Carrot Top design, which is where it gets its name: in my family, leftover vegetables get mashed up and fried, and called ‘bubble and squeak’. I’m not sure why. But it is delicious! Like the Carrot Top hat, cabled plaits grow organically out of the ribbing, and are gathered at the crown. This version features only the narrower plaits, redrawn in a dense overall pattern with purl stitches helping to define each cable strand. The charts have been simplified, and the ribbing has been lengthened so that the hat can be worn with the brim turned up. Materials: You will need approximately 200 yards of DK-weight yarn (or 160 yds if omitting pompoms). Sizing: One size fits most. This hat is very stretchy, and will fit head circumferences of 20” to 24”. Suggestions are included for resizing by adding or omitting pattern repeats. Experience with the following skills is recommended: knitting in the round, knitting cables, and increasing and decreasing. For a simple pompom tutorial, see my blog post on making pompoms.